Escuela Normal Superior de Medellín (Antioquia Department) was originally established on 1 January 1851, as Escuela de Institutores. The flag of the institute is in proportions 1:2, horizontally divided white-yellow-green. White is a symbol of purity and of sincere research in humanist education and pedagogic knowledge. Yellow is a symbol of spiritual resources and search for utopia that widens the personal and social horizon. Green is a symbol of hope in the force of the youth and in the work of the educationalists. Universidad de Medellín (UDEM) was founded on 1 February 1950 by professors and students seceding from Universidad de Antioquia, as a response to "intolerance and ideological persecution". In 1951, the university was transferred to the Campus of Belén los Alpes, located south-west of Medellín. The flag of UDEM was designed by Dr. Francisco López de Mesa, one of the founding members of the university, as a piece of white satin, 1.80 x 2.80 m (that is, with proportions 9:14). The emblem of UDEM, surrounded by seven red fleurs-de-lis, is placed in the upper central part of the flag, surmounting 34 sea green triangles, placed 1+6+11+16 and seven fleurs-de-lis argent placed along the bottom of the flag. The flag has a golden fringe and a Greek torch as its finial. Each of the seven red fleurs-de-lis surrounding the emblem represents 10 of the founders of the university watching its progress. Each of the 34 triangles represents 5 of the 170 students founders of UDEM. Each of the seven fleurs de lis argent represents seven of the 49 professors founders of UDEM, who form the base of the students' pyramid. The golden fringe is a tribute to the sponsors of the university. The Greek torch conveys the ideals of independence and liberty of thought. The emblem of UDEM, also designed by Dr. Francisco López de Mesa, is circular, with a green border symbolizing hope and prosperity. The name of the university ("UNIVERSIDAD DE MEDELLIN") and its motto ("CIENCIA Y LIBERTAD", Science and Liberty) are written in golden letters in the upper and lower part of the shield, respectively. 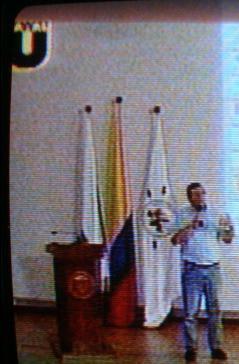 The shield of the university, placed over a ribbon of the Colombian colours, is quartered. The first quarter, with a border argent, shows the logo of the town of Medellín on a blue background. The second quarter, with a border or, is white with a red bend sinister and a pair of scales, a symbol of equity, also recalling that the Faculty of Law was the first created in UDEM. The third quarter, with a border argent, is charged with an open book whose left page is charged with a golden Greek letter "Pi", a symbol of sciences. The fourth quarter, with a border or, shows on a black background a Greek torch raised by a young hand, as a symbol of liberty, without any political, racial..., distinction. The flag is a white horizontal flag with the Coat of Arms in the middle, surrounded by four red fleur-de-lys in a diagonal manner pointing to each corner of the flag. Images from pictures taken at a tv interview broadcasted on Canal U on January 17, 2010. For more information please see: Universidad de Medellín (official website). "Colegio Distrital Técnico Menorah" was set up by Contract No. 771 signed on 14 December 1974 between the Secretary of Education of Bogotá and the B'nai B'rith Jewish Ladies' association. The Menorah Foundation, set up on 22 November 1993 in Bogotá and incorporated on 22 April 2003 in Miami, USA, is in charge of the equipment and management of the institute. The menorah, a seven-branched candelabrum, has been a symbol of Judaism for almost 3000 years and is the emblem of Israel. The flag of the institute, as shown graphically on the website of the institute, is horizontally divided white-blue-white-blue-white. Overall and respective stripe proportions are not given, but it can be assumed they fit the specifications of the national flag of Israel. Instituto Técnico Mercedes Abrego is located in Popular borough, part of the municipality of Cúcuta (Norte de Santander Department). The institute was formed by the merging of Instituto Técnico Comercial Mercedes Abrego (est. by Ordinance No. 28 of 21 November 1960), Colegio Hijo del Educador (est. by Decree No. 95 of 3 November 1985), Escuela Sagrado Corazon No. 3 and Escuela Sagrado Corazon No. 4 (both est. by Decree No. 199 of 5 March 1954), prescribed in 2002 by by Departmental Decree No. 810. The institute is named for Mercedes Abrego de Reyes (1770/75-1813), a patriot from Cúcuta who was summarily executed by the Royalist troops after she had cut a brigadier's uniform for Simón Bolivar. The flag of the institute is horizontally divided blue-white with the institute's emblem in the middle. "Liceo Feminino 'Mercedes Nariño'" was founded on 5 October 1916 in Bogotá by Priest Diego Garzón, as "Sindicato de la Aguja, Artes y Oficios" (Syndicate of Needle, Arts and Works) to prepare women to household work. The institute was later renamed "Escuela Departamental Superior de Artes y Oficios para señoritas" (Departmental Higher School of Arts and Works for Women) and "Liceo Femenino de Cundinamarca" (1958). On 18 June 1960 (Decree No. 778), the institute was dedicated to Mercedes Nariño, the daughter of the precursor of the national independence, Antonio Nariño. The flag of the institute, as shown graphically and described on the website of the institute, is horizontally divided blue-white-red. Blue represents loyalty, confidence, knowledge, intelligence, faith, truth and eternal heavens. White is associated to light, kindness, innocence and purity; it is considered as the colour of perfection. Red represents energy, vitality, power, force, passion, value, aggressivness and courage. "Corporación Universitaria del Meta" (aka Unimeta) was founded on 16 November 1982 in Villavicencio. 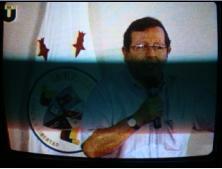 Redacted by Rafael Mojica García, the statutes of the university were approved on 28 March 1983. The university was recognized by the Ministry of National Education on 5 August 1985 (Decree No. 12249, published in the Colombian official gazette on 16 September 1985). The flag of the university is prescribed by Decree No. 009 of 31 August 1988, signed by Rector Rafael Mojica García. 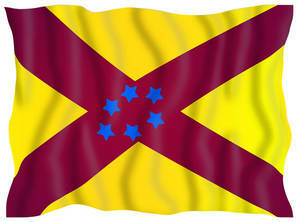 The flag of the "Corporación Universitaria del Meta" shows on a reseda yellow ("gualda") background a cardinal red ("purpurada") St. Andrew cross stretching diagonally over the flag. On the cross are placed six blue stars representing the areas of knowledge prescribed in the university statutes. The colours match the patriotic colours." The Decree is given on the university website, together with a colour photo of the flag. If I understand correctly Article 2, the colours should be the same as on the Colombian national flag. On the photo, the yellow background has faded to white and the saltire is not symmetrical, reaching the corner of the flag only in the upper right part. Colegio Miguel Antonio Coro (COLMAC), located in Bogotá, was founded in 1951 by Adriano Beltrán Acuña, who transferred in 1977 the institute's ownership to Sociedad Tecnológica y Educativa Ltda. The institute is named for the classicist scholar and Conservative politician Miguel Antonio Caro (1843-1909), President of the Republic in 1892 and 1894-1898. The flag of COLMAC is shown on the institute's website as horizontally divided red-blue-white-red-blue, 2:1:6:1:2. White represents peace; to stress the need of harmony and sincere unity among the institute's members, the white stripe is placed in the middle of the flag and its height is equal to the cumulated height of all the other stripes. The red stripes represent the youth vigor, the commitment to study, the joy shared by the institute's members and their eagerness in the quest of greatness. The blue stripes represents infinite heavens fostering deep ecstasy. "Institución Educativa Departamental 'Miguel Antonio Caro' " (IEDMAC) was founded, as "Unidad básica", on 20 May 1997 (Municipal Decree No 6) at Funza, Department of Cundinamarca, mostly to handle the numerous students who had been expelled from the other institutes of the municipality. Per the Departmental Decree No 9786 of 21 November 2007, the institute has now eight seats (Miguel Antonio Caro, Policarpa Salavarriata, San José, San Andrés, María Immaculada, Jardín Infantil, Vivencias, La Unidad and Retorno al Aula). The institute is named after the classicist scholar and Conservative politician Miguel Antonio Caro (1843-1909), President of the Republic in 1892 and 1894-1898. 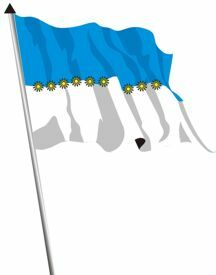 The flag of IEDMAC, as shown graphically and described on the website of the institute, is horizontally divided celeste blue-white with nine yellow sons representing the nine seats of the institute, placed horizontally over the border of the to fields. (The nine suns also appear on the crown surmounting the emblem of the institute). "Institución Educativa Distritál 'Miguel de Cervantes Saavedra'" was set up on 27 August 2002 by the Federal District of Bogotá (Decree No. 2524), succeeding "Centro Educativo Distritál de Educación Básica y Media 'Miguel de Cervantes Saavedra', which had been founded on 11 August 1997 (Decree No. 5581) by the merging of "Colegio La Marichuela" and "Colegio 'Miguel de Cervantes de Saavedra'"
The flag of the institute, as shown graphically and described on the website of the institute, is horizontally divided green-red (2:1). Green represents vitality, youth, hope, respect and dedication. Red represents fluor, humor, victory and liberty. Institución Educativa Escuela Normal Superior Miguel de Cervantes Saavedra is located in San Juan Bautista de Guacarí (Valle del Cauca Department). The flag of IE ENS Miguel de Cervantes Saavedra, designed by Héctor Gerardo Troches, is horizontally divided white-green. White is a symbol of peace and progress. Green is a symbol of aspiration to progress in a peaceful context. Institución Educativa Millán Vargas originates in a boy's school established in 1958 in the Millán Vargas borough, part of the municipality of Sampués, Department of Sucre. Originally known as La Chivera, the borough was totally destroyed by a blaze on 27 March 1957; the rebuilding of the borough was organized by the Governor of Bolívar, Miguel Millán Vargas, for whom it was soon renamed. The school was officially organized by Decree No. 25, adopted on 23 February 1963 by the Government of Bolívar. The flag of the institute, adopted in 1975, is divided red-blue by the ascending diagonal. Red is the colour of love, of commitment to the educational process and of the connection of human beings with their natural environment. Blue is the colour of aspiration to knowledge and education. Colegio Cooperativo Minuto de Dios was established in 1973 by Rafael García-Herreros Unda (1909-1992), founder in 1958 of Corporación Educativa Minuto de Dios, which manages now 24 educational institutes all over Colombia, and Andrés Emiro Díaz Contreras. The flag of the institute is horizontally divided red-orange-yellow-green-light blue-blue-purple. This flag is likely based on International Co-operative Alliance Organization’s flag of 1925. Instituto Técnico Misael Pastrana Borrero - Paz y Futuro was established in Cúcuta (Norte del Santander Department) by Departmental Ordinance No. 2 of 12 May 2000, as Instituto de Educación Media Técnica Misael Pastrana Borrero. The institute set up a convention with the social and educational corporation Paz y Futuro (Peace and Future), approved by Departmental Ordinance No. 28 of 21 July 2000. Instituto Técnico Misael Pastrana Borrero - Paz y Futuro was established by Decree No. 891 of 30 September 2002, which merged Instituto de Educación Media Técnica Misael Pastrana Borrero with Colegio Básico San Pedro Claver No. 64, Colegio Básico San Mateo, Colegio Básico María Goretti No. 18, Colegio Básico Julio Pérez Ferrero, Colegio Básico Club de Leones No. 29, and Escuela Santísima Trinidad. Decree No. 204 of 11 February 2003 incorporated Colegio Básico Guaimaral No. 25 to the institute and detached Colegio Básico Julio Pérez Ferrero from it. Colegio Básico Guaimaral No. 25 was eventually detached from the institute by Decree No. 774 of 21 July 2003. The institute is named for the lawyer and politician Misael Pastrana Borrero (1923-1997), President of the Republic of Colombia from 1970 to 1974. The flag of the institute is horizontally divided white-yellow-white-green (3:1:1:1). White is a symbol of the pure, immaculate and great Creator; it is a symbol of kindness and purity, of everything. Yellow is a symbol of the spiritual resources, of energy and of value. Green is a symbol of aspiration in a promising future, is the colour of the land and fields, and is symbol of the strength of nature and an invitation to leave in peace with the natural environment. Jardin Infantil Mis Pequeñas Personitas is located in Cúcuta (Norte de Santander Department). The flag of Jardin Infantil Mis Pequeñas Personitas is horizontally divided blue-red with a white disk in the center, charged with the school's emblem. truth and the eternal sky. Red is the color of fire and energy, of force, determination, passion and love. The emblem features children and the world. It is a symbol of equality of gender, race, age class, religion and social condition.